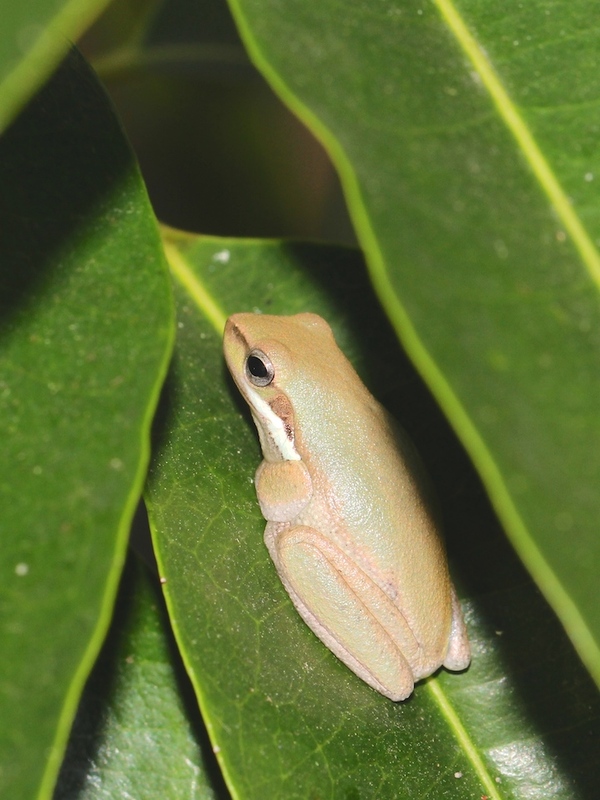 The Dry season isn’t the best for frogs but this Eastern Dwarf Tree Frog, Litoria fallax, seemed comfortable enough amongst the shady leaves of a tree on the edge of the Town Common. He was spotted by my companions on another of Wildlife Queensland’s monthly field trips, one which introduced me to the boardwalk behind the Sustainability House in Rowes Bay. In the Wet, of course, the boardwalk passes over very swampy ground – ideal frog territory – but now it has all dried out. According to frogs.org.au (the best online froggy information source I know of) the species grows to “less than 30mm” long; 25 – 30mm is common and about right for this one. Colours are somewhat variable but the whitish streak from eye to shoulder (very obvious in my photo) and the dark streak from eye to nose (less obvious) are normally present. Wikipedia confirms all this and adds that the species is very common along our Eastern coast from about Cairns to central NSW. Frogs don’t often appear on Green Path, simply because so many of my subjects are drawn from my own suburban garden and we don’t have any permanent water. Making a frog pond is one of those nice ideas which has never quite become reality although there are plenty of sites online which give instructions, advice and encouragement – visit SGA, FNPW or BBY if you want to do it yourself. Frogs and tropical plants at Mary Who? The full programme apparently begins at 9.30 with a public “Read-in” and continues with children’s book events but they are not listed on the bookshop’s facebook page so you may have to contact the shop’s staff for details. 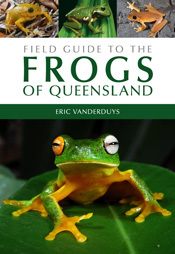 Author malcolmPosted on August 9, 2013 August 10, 2013 Categories Books, Gardening, ReptilesTags dry tropics, food, frog1 Comment on Frogs and tropical plants at Mary Who? Yesterday I discovered him enjoying the cool water in the bottom of our old concrete laundry tub and hauled him out to take a photo on the way to a safer place. As I noted a while ago, they adapt their colour to their surroundings and this one had spent hours trying to look grey-brown. He didn’t manage to change as much as this virtuoso, however. 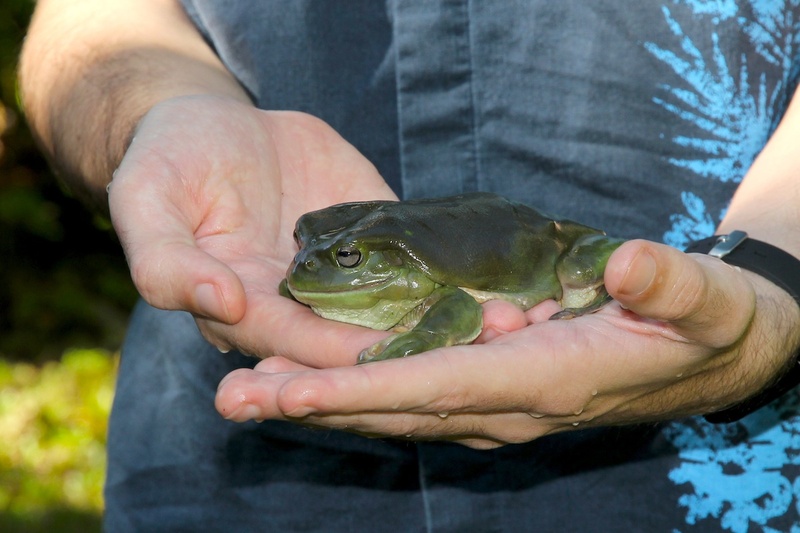 Handling frogs is not generally recommended because salt, oils and traces of other chemicals on our skin can be passed on to them and harm their health. Their damp, delicate skin is easily damaged by rough handling, too. 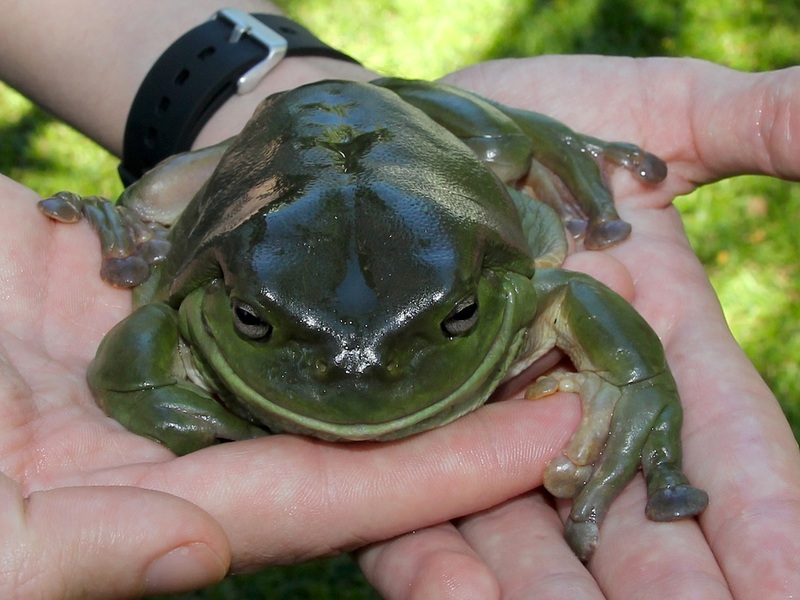 Washing our hands in clean water and handling the frog immediately after – with our hands still wet, as seen below – is best for them. * We measured him the same evening: 11.5 cm. Wikipedia is wrong! !